Three full weeks of the NFL preseason schedule have been completed, giving us a larger sample size to delve into just how each of the 2018 NFL Draft first-round picks has fared in their respective action so far. Mayfield retains his place at the top of the rookie quarterback rankings with an 81.7 overall grade, which is not just the best mark among rookies, but the seventh-best mark among all quarterbacks with at least 30 dropbacks this preseason. 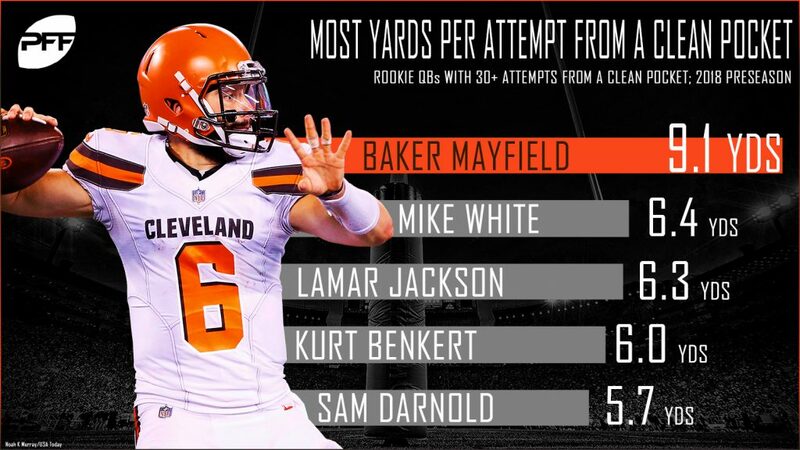 Mayfield has been head and shoulders above his classmates in terms of passing from a clean pocket and through three games, he’s produced a passer rating of 120.6, an elite passing grade of 91.6 and averaged 9.1 yards per attempt — all of which rank first among rookies with at least 30 attempts without pressure this preseason. Barkley has been limited to just to just six preseason snaps so far, but he still performed well enough on those limited snaps to earn a top-20 grade. His first and only game of the preseason came Week 1 against the Browns, where he carried the ball four times and racked up 43 rushing yards, with 39 of those yards coming after contact. The Sam Darnold era is fast approaching for the New York Jets. Through three games, Darnold has logged an impressive adjusted completion percentage of 79.5 percent, which is tops among rookie players at the position. He’s thrown 45 pass attempts so far this preseason and joins Tennessee’s Luke Falk as the only rookie quarterbacks who have attempted at least 30 passes and not thrown a turnover-worthy pass.